The Home Scientist: Major Lab Renovation Part 1: First Steps! 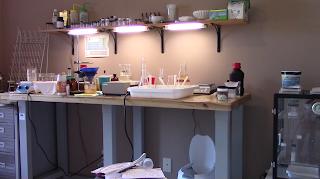 My home chemistry lab is set up in one of the spare bedrooms of my house. With a single large window, it was probably intended to be an office space. My current table and storage cabinet is "garage work area" furniture. 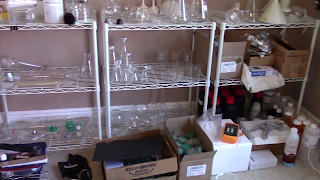 This is my main work area, and the cabinet holds some equipment and chemicals (mostly flammables, since this is at least a metal cabinet). It looks nice, but isn't ideal. The tabletop is soft wood that dents easily, and has absorbed some spills over the years. You can also see I use up a lot of counter space! (I need to clean up more often!) The cabinet has some significant rust on the inside, probably from acidic vapors when I used to store acids in it. Some of the exterior metal is rusted as well. 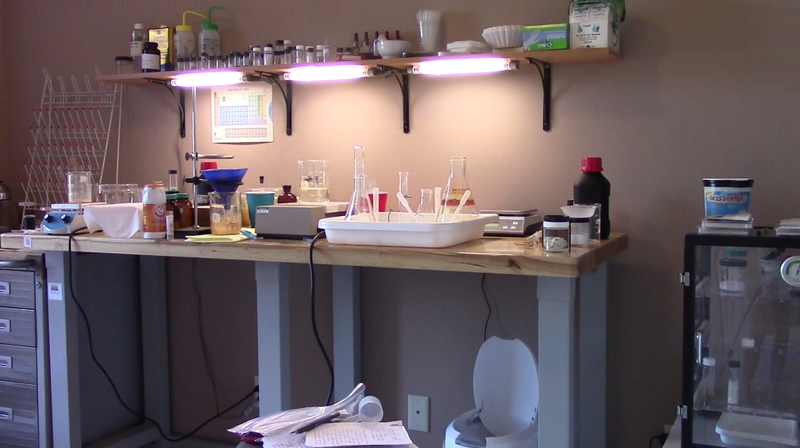 Above that is a shelf I installed with some extra equipment and assorted vials of small chemical samples. On the opposite wall is my glassware storage area. These are simple wire racks from Home Depot. The problem here is there just isn't enough storage space. I've got stuff strewn about all over the floor in front of the shelves. Inside the closet is my main chemical storage area. The wire rack is segregated by storage code, with general storage on the top shelf, oxidizers on the middle, and (mostly) corrosives on the bottom. To the left is my "safety corner" with a fire extinguisher and bowl of sand for fires, vinegar and baking soda for base and acid spills (respectively), and sodium thiosulfate to neutralize halogens. 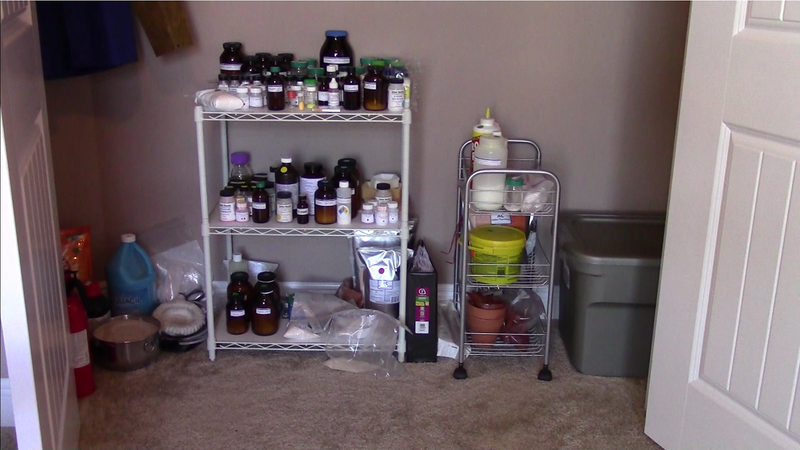 To the right is a Rubbermaid tub that holds all my acids. Inside is a layer of baking soda to absorb acid vapors and neutralize any leaks. 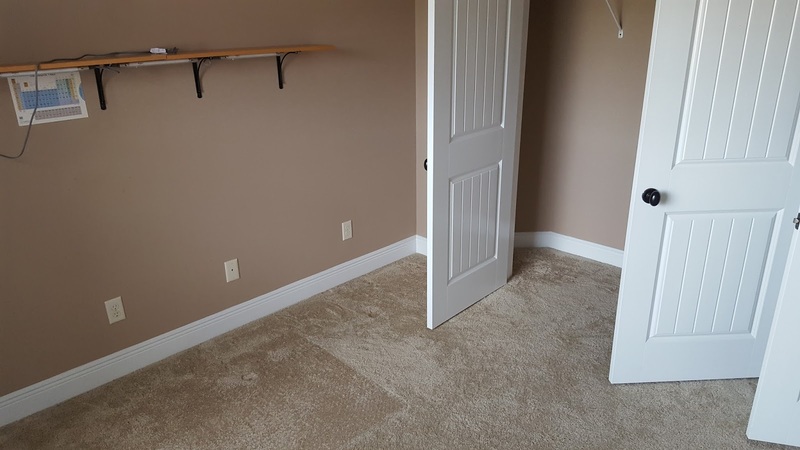 Another problem with the lab space you may have noticed is that the room is carpeted. Obviously this is not ideal for a lab; carpet can be stained easily, and tends to hold onto chemical odors. I've been using a plastic chair mat (for rolling chairs) to cover the area directly under my work space at the table, which has worked decently well. 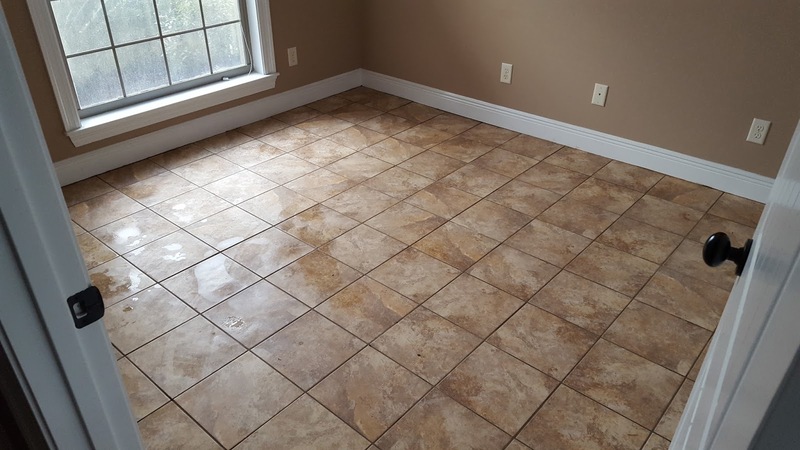 And now, as of a few minutes ago, tile is in! The furniture is on order, and will likely take a month or two to get in. Check back here for updates!